1N. Benzaoui (e-mail: Nihel_Djoher.Benzaoui@alcatel-lucent.com), Y. Pointurier, and J.-C. Antona are with Alcatel-Lucent Bell Labs, Nozay, France. 2T. Bonald is with Telecom ParisTech and LINCS, Paris, France. 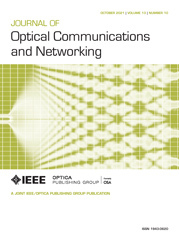 Optical slot switching has formerly been proposed as a flexible solution for metropolitan ring networks to carry data traffic with a subwavelength switching granularity and with good energy efficiency, which is enabled by optical transparency. In this paper, we propose for the first time, to the best of our knowledge, several architectures for the electronic side of optical slot switching nodes to increase flexibility through the addition of electronic switches, working either at client packet granularity or at slot granularity. Such electronic switches can be located at either the transmitter side or receiver side, or at both sides of a node, thereby decreasing traffic latency, at the expense of increased node cost and/or energy consumption. This paper focuses on the latency aspect. We investigate the impact of a timer that can be used to upper bound the slot insertion time on the medium. We also propose a novel client packet queuing model in an optical slot switching ring and assess and compare the latency of these node architectures analytically and with simulations.